ASPCA, Where Were You When We Needed You?
. Among these were certain kinds of elephant, lion and bear that used to populate North Africa and possibly parts of Greece and Asia Minor. 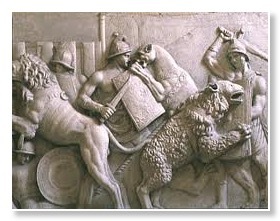 Animals were taken from wherever the Roman military (which did most of the capturing and transporting) could reach. 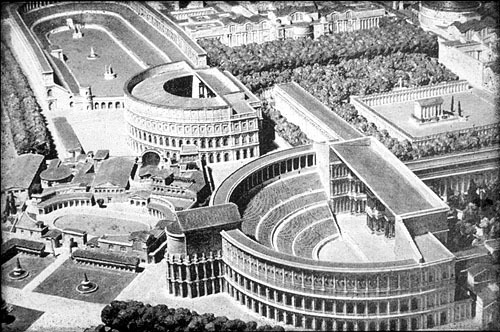 At the inauguration of the Coliseum (the Flavian Amphitheater - 80 CE), 9,000 animals were slaughtered. Can we even get our 21st century heads around the mood of a people who would sit still through such butchery? It is hard to imagine. Here are some of the other animals sacrificed to the arena: bulls, hippopotamuses, crocodiles, panthers, tigers, leopards, giraffes, monkeys and ostriches. Not all were hunted; some were trained and taught to perform tricks. Others were made to fight each other, or attack criminals as a form of execution. Today, we concern ourselves with the elephant, and one event in particular that occurred in 55 BCE at the dedication of the Theater of Pompey. The monument and the entertainments provided during its 5-day inauguration were a thinly veiled attempt by Pompey to remind everyone how great he was. (after all, he wasn't given the moniker Pompey Magnus for nothing). But he was still considered by most of the senate as an outsider, not 'one of us.' His construction of the theater, its temple and the roaring, trumpeting reminders of his victories in Africa were a typical Roman's way saying to the people, "I'm so lovable, won't you like me as you used to?" While the Greeks and Carthaginians saw elephants as tools for making war, the Romans found them more of a curiosity, putting them on display for the first several hundred years they knew about them. It wasn't until the first center BCE when the venationes got into full swing that they found more entertaining ways to use them. They were also revered and studied 'scientifically,' at least by a few. All right, perhaps the elder Pliny had quaffed one cup of spiced wine too many when he wrote the above, but there is something about this (usually) gentle giant that makes you want to give it a hug, isn't there? Too close for comfort? How about feed it a peanut through sturdy bars? Do you recall the expression "pyrrhic victory," meaning both sides in a conflict suffer so badly that one can hardly be called a victor? Elephants were there when the phrase originated, wreaking havoc with Roman cavalry. One may wonder who was more terrified, the rider or the horse. This was back in 280 BCE when King Pyrrhus from the Greek city-state of Epirus invaded Italy to settle a complicated score involving most of Italy, even Carthage. is to the right, the temple of Venus Victrix is at the top of the semicircular amphitheater. Emperor Domitian's Odeon and Stadium are in the background (not built for another 125 years). WARNING: read no further, minors, empaths or other beings weak of stomach. This excerpt is not for the squeamish. The morning was filled with music and gymnastic competitions. When the great tragedian Clodius Aesopus took the stage, the raucous applause multiplied with such amplitude in the acoustically perfect bowl of the amphitheater that I was obliged to hold my hands to my ears. After several soliloquies, the aged actor spied his old friend, Cicero, and called upon him to ascend the stage. While this galled both consuls, there was little to be done about it without appearing ungenerous, so they were forced to endure an unscheduled performance by the orator. Cicero, like Aesopus, never missed an opportunity to perform, but he was gracious and blessedly brief, congratulating both Pompeius and Crassus (which visibly annoying the former) before taking his seat once again. A small group of players took the stage and spent a moment tuning their instruments. The crowd grew quite. Then, from the opposite end of the stage, a woman of roughly forty years emerged from between the giant columns so quietly and unobtrusively that the audience, their attention drawn to the greater activity and noise of the musicians, did not notice her entrance. When at last a knot of those in the lower tiers saw her and recognized her, their enthusiasm swept up the curved rows until the entire amphitheater was on its feet. Galeria Copiola, the most famous of all the interlude dancers of the Roman theater, had been coaxed out of her six-year retirement by Pompeius. She had given up her art at the height of her abilities, having found that wealth, of which she had accumulated much, was preferable to fame, of which she had had enough. “Better to leave,” she is reputed to have said, “to the cry of tears than the outrage of offended jeers.” A lesson learned by far too few of the politicians who witnessed her final performance that day. The interlude dancer provided entertainment while actors and stage hands prepared for the next act in the play, which was always a comedy, since dance and pantomime, especially of Copiola’s sprightly energy, did not lend themselves to tragedy. This performer and her talent were so beloved that when she was on the bill, she packed the old wooden theaters regardless of the play being performed. While her performance this day was as memorable as the leaps and twirls of her teens, forgive me while I allow the lady Galeria to lapse back into her early retirement so that I may rush ahead to describe the day’s finale. Within moments after her final number, an army of stage hands began to appear between the tall columns at the back of the stage. Each pair of men carried a segment of iron fence, six feet wide by ten feet tall. Three vertical bars were topped by gold-painted spikes and weighted at the base with heavy iron plates. The workers quickly created a barrier about the entire circumference of the orchestra and stage, each segment linked to its neighbor by heavy bolts through each crosspiece. When it was done, Pompeius walked through an open section directly before us, crossed the semi-circle of the orchestra and climbed the stage. He stood inside the enclosure, dwarfed by a fifteen-foot tall statue of Venus draped in fine, green wool, the color of the goddess. The marble likeness smiled down upon him, peering over the bars that separated them. Pompeius, normally one for whom the dimmest star was more discernible than his own inchoate sense of humor, smiled and soldiered on. “On this the final day of dedication of my theater, what goddess better exemplifies the Roman spirit than Venus Victrix, embodiment of both beauty and victory. Today, I place upon the largest altar ever built in her honor a sacrifice of such proportions it will dwarf anything offering that has come before. “The creature loxodonta africanus pharaoensis is no stranger to Romans. Our ancestors knew them, fought them, captured them, defeated them. King Pyrrhus brought them to our shores to wage war against us. Your ancestors have seen them but two or three times, always on display, docile, chained, paraded about like pets on their leashes.” The crowd began to stir, and I, too, had the sinking premonition that there are times when the best seats in the house are those furthest from the stage. “Today,” Pompeius continued, “A story for your grandchildren. You will pass on to them the lesson first Epirus, then Carthage learned to their undoing: no army, no creature on earth is a match for Rome’s indomitable legions! Never before have the monstrous beasts you are about to see fought so close to the city walls. Not until today! 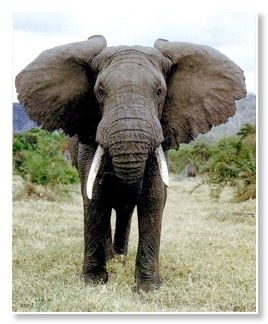 I give you … the African War Elephant!” A fanfare sounded while Pompeius crossed back to his seat. As his section of fence was bolted shut behind him, from the shadows of the proscenium, a small, dark and barefoot man, wearing nothing besides a loincloth and a willow switch backed onto the stage. He spoke foreign, halting words and gently tapped his branch on something lingering in the shadows. My lady did not look reassured, but even she, like the hushed crowd, was struck by the wonder of the animals being led into the light. The elephants were over ten feet tall at the shoulder, fifteen feet in length, with long, curving white tusks that flanked their drooping trunks. Their ears, thin and veined, were larger than the feathered fans that waved us cool in summer. It should have been the most terrifying site any of us had ever seen, yet their eyes looked out at us with benign intelligence and unutterable sadness. I thought I must be ascribing human feelings to the moist, black orbs which gazed at us, but when the creatures’ trainer, having lined nine of the elephants up on the left side of the stage returned to lead the second group out, there was no mistaking the tears that stained his dusty cheeks. When all were assembled, he walked up and down the line of eighteen males, reaching up to pat their cheeks, soothing them with lies. As he passed, several of the animals blew gusts of air or raised their trunks to sniff at him. Behind him, from each side of the stage, eight tall, olive-skinned men costumed in Roman military tunics, sandals and helmets entered the fabricated arena and lined up, their backs to the audience. Their shields were not Roman, but small and round, painted with designs of white and brown. If anyone looked ridiculous, it was they. There was one, nearest Pompeius on the other side of the bars whose bronze helmet bore the black and white plume of an ostrich feather. He, like all the others, balanced a long, smooth lance in his right hand, much different than our shield-piercing pilum. Ours were tipped with soft iron, meant to be thrown once to disrupt an enemy’s line, bending upon impact lest they be hurled back at our own troops. These African weapons, with their flat, leaf-shaped spearheads were designed for deep penetration. The gates through which the Gaetulians entered clanged shut, startling the animals. They brayed and bumped into each other, clearly becoming more agitated at the sight of what they had recognized as their assailants. Their trainer had retreated to the far right corner where Pompeius had stood before the statue of Venus. The little man leaned with his back against the bars, eyes closed, hands pressed together. I doubted his prayers would be heard. The soldier with the ostrich plume said something to his men and stepped forward. He hefted his spear, calling out to his victim, motioning with his free hand. Stepping forward with his left foot, he threw the javelin with such speed and grace the spear cut the air as if it had been loosed from a bow. The point entered just below the animal’s left eye, deftly skirting the armament of muscle and bone to rend the soft center of its life, killing it instantly. It’s legs, lifeless pillars, buckled; the corpse crashed to the stage, snapping the spear with a stomach twisting crack as the creature hit the ground. On both sides of the fallen giant, the animals screamed and side-stepped away in terror. The elephant furthest to the right smashed into the fence with force enough to break several of the iron crosspieces, shoving the marble Venus into the column behind it. Her head broke and fell, then the rest toppled in a crash that sent the animals in a wild-eyed search for safety. The crushed trainer lay in a crumpled, lifeless heap, forever spared the sight of the carnage to come. The audience’s cheers were ecstatic. Rather than charge and retaliate, the elephants appeared desperate to escape. Javelins were now being flung at them by all the hunters. Believing the place where they had entered the arena was the way to their salvation, they bunched about at the rear of the stage, crying out as they pressed against the bars, being wounded all the time in their flanks and legs. Their grunts and cries, pitiful wailing notes were pressed indelibly into every ear. Tertulla turned away. Our eyes met and I could see the water welling brightly in hers. The crowd grew silent, their jubilation extinguished. Suddenly the elephants turned and rushed away from the rear of the stage, stampeding toward their executioners, stumbling over the bodies of those already dead or dying. At first we could not discern the reason why they reversed direction, but then we saw that men with torches had appeared at the rear of the theater, jabbing with their flames, denying the stars of this last day of celebration their exit. “Madness!” Crassus shouted, grabbing his wife. “Stay here, Alexander. Be my witness.” They were already up and moving. Truth to tell, had I wanted to flee, my legs would have betrayed me. The Gaeulians circled round to the right. The elephants, only ten remaining now, ran headlong toward the curving fence, straight at us. Iron had never looked so flimsy. Pompeius crouched horrified, his hands clutching the wreath on his head. His guards and lictors huddled about him. The animals’ flanks were exposed, and the hunters loosed a barrage of javelins that thumped and tore into their thick hides. Instinctively fleeing from the source of these new wounds, the victims collided with their brothers, the entire herd smashing headlong into the barrier just beyond us. The fence folded outward over the first rows of seats like a jaw dropping. I saw two men knocked flat and bloody by the iron bars; there may have been more. These were not senators, who had already fled to higher ground, but fools looking for a better view. Voices rose behind us, a new noise of protest. People were on their feet, demanding that Pompeius stop the killing. When their cries went unanswered, their shouts turned to curses. A cup of wine careened off my shoulder, splashing Magnus’s back with scarlet. One beast separated from his fellows and turned toward the hunters. Blood stained his hide black. His ears flared in defiance; he trumpeted with rage and stumbled forward, cutting off his attackers’ retreat. He was driven to his knees, but reaching out with his trunk, snatched a shield from a screaming African and flung it into the stands. It arced high overhead, as if the animal had been trained to perform a trick. His head sank to the ground and the hunter drove his spear into the neck at the base of the elephant’s skull. 25,000 groaned as one. Only five of the original eighteen animals were left alive, all with mortal wounds. They gathered at the front of the orchestra, facing a stunned and horrified crowd, seeming to plead with them directly with raised trunks and cries of the most pitiful nature. The audience jeered the hunters and hurled curses down upon Pompeius. Many stormed from the theater, their tears mingling with vows never to return again. As the remaining elephants’ strength gave out, they sank to their knees, their breathing rattled and labored, yet powerful enough to blow dust up to sparkle in the afternoon sun. The hunters approached, spears held high. Uncomprehended shouts of “cowards” and “barbarians” pelted them from above; the garbage flung down upon them was better understood. The chief Gaetulian shook his spear at the Romans, returned their epithets in his throaty tongue and ran to stab the nearest elephant for spite. As he raised his javelin, the animal rose up on his front legs, using the last of his strength in a final attempt to get away. The hunter with the ostrich plume moved in close enough to touch the beast and grabbed his spear with both hands for a killing thrust to the heart. But he was too late. The elephant moaned, one of the saddest sounds I have ever heard, and died. The hunter jerked back to avoid the rolling corpse, but he wasn’t fast enough. One foot was caught by the dead animal as it rolled on its side. Off balance, the headman squealed and jabbered as he fell backwards, kicking with his free leg at the grey wall descending upon him. I could not hear the bones of his legs break, but I could see his eyes bulge like eggs as the lower part of him was squeezed up into the upper half. His countrymen rushed to his aid, pulling his arms to free him from an embrace with no release. He screeched at them until the wave of his jellied insides pushed their way out his mouth. Then he was silent. It was the first time I had heard the crowd cheer since that same man had killed the first elephant. While this was happening, Pompeius left the theater under guard, without comment or apology. Eighteen elephants died that day, along with any hope that Pompeius' millions had bought the renewed love of the people he had so wished to purchase. A gladiator crying for succor, running from his opponent would be jeered and reviled; but let the mirror of that same behavior be exhibited by these lumbering, implausible creatures and the empathy of the crowd is aroused. There is no logic to it, except perhaps this: the elephants could easily have overpowered the hunters and crushed them. That they appeared to spare them, offering their own lives instead, was seen as noble. I shall never understand these Romans.